Welcome back to Archive Trap, the unofficial guide to Magic: the Gathering. Theros is another top down setting like Innistrad, based on Greek myth, and in that respect it is a flavor home run. Unlike the previous mythology-inspired set, Kamigawa, Theros is based on a mythology that most people in the west understand and can identify with. Whether it's because having read a greek epic in school, or seeing anything from the original Clash of the Titans all the way to Xena: Warrior Princess, Wonder Woman, or Percy Jackson, you have some familiarity with the source material. It is also the first setting since Urza's Saga to feature an Enchantments matter theme, and although the mechanics were not as well received as the flavor, it remains one of the multiverse's most iconic locations. Nyx has truly captured my imagination in a way that I did not expect. Theros is all about the flavor of Greek mythology, and as such magical creatures associated with Greek mythology are at the forefront. Because of that, there is not much to say here to give you the basic groundwork for Greek myths. Essentially, Theros has fifteen gods that each represent something different to the people of Theros. What is interesting is that as the setting goes on, it becomes clear that it is beliefs that shape the gods, and that new gods could be born through various means. Something about the nature of the realm of Nyx, the home of the gods on Theros, allows this to happen and endows these gods with great power. Both stories that take place on Theros — Xenagos's attempt to become a god and Ashiok's attempt to make one — focus on this aspect of Nyx. In addition, both the gods and creatures of Nyx are living enchantments, a magic unique to the gods. Although we ultimately learn little about Nyx, what we do know gives us a tantalizing glimpse into what we could see in the future of Theros. Meletis is the Athens of Theros. Theros is an unusual plane in many respects. It is a flat landmass, not a sphere, with a literal edge to the world. It is divided up into three major known regions: Meletis, Akros, and Setessa. Setessa is located in the forests to the north of the continent, with Akros to the east and Meletis to the south or south west. Meletis is a coastal city along the Siren Sea. Surrounding Meletis are the Dakra, a series of islands populated by monsters and magic. To the west across the sea lies the edge of the world, where Kruphix rests at the horizon. Somewhere between Meletis and Kruphix's Temple is Arixmethes, a legendary city that sunk into the sea, Theros's Atlantis equivalent. Arixmethes is actually built onto the back of a giant kraken. Somewhere in the deep is another lost city, Olantin, sunk long ago by Heliod. Akros is the Sparta of Theros. To the north of Meletis is the Nessian Forest and Setessa. Skola Valley lies along the border with the Nessian Forest. To the forest's south are the Despair Lands, ruled by Erebos and likely where the necropolises of Asphodel and Odunas lie. To the east is Akros, a city pressed up against a giant river gorge. Below Akros in the gorge is the Deydra river. Further east beyond Akros are the Leonin lands, with the settlements of Oreskos and Tethmos. Beyond that is an forest whose bounds are unknown to the Therosi. Theros's night sky does not look upon a wider universe, but instead the night sky is a representation of Nyx, the home of the gods. 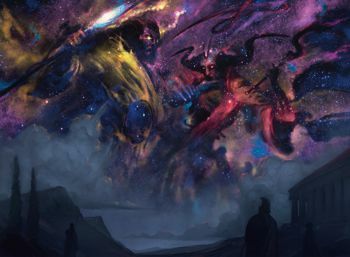 It is not clear exactly what Nyx is, but it is not connected to Theros physically and it is not possible to planeswalk to or from it. There are two ways to get in and out, the first through what seems to be a portal at the edge of the world, between Kruphix's trees. The other is through Nykthos, a temple to all the gods built in the mountains, although only gods can return to Nyx from Nykthos. This is the first block in which Elspeth takes the lead role. Meletis is Theros's version of Athens. It is the center of learning on the plane, and is ruled by a council called the Twelve. 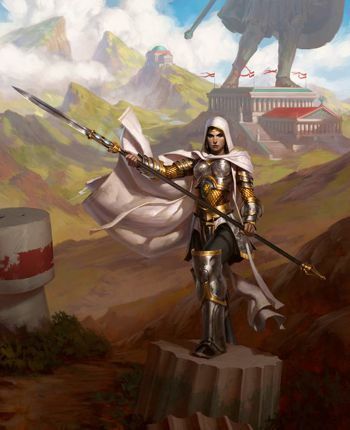 Setessa is Theros's version of the Amazons, a woman dominated collective with no marriage and communal property. Once they reach adulthood, boys are expected to leave and travel, making the city populated primarily by women and children. Akros is the plane's version of Sparta, ruled by a king with a heavy martial theme. The leonin are also led by a King in the lands beyond Akros, but it is an earned title rather than an inheritable one. The other non-human societies are not as well defined and typically live in loosely affiliated bands. Merfolk on Theros are called Tritons. The plane was once ruled by a race of powerful beings called Archons. 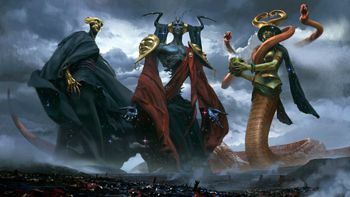 These archons were defeated and driven out by the gods, but their leonin servants were also cast out, and now live apart from humanity. Undead are slightly different on Theros, with zombies being creatures who have left the underworld but do not retain their identity or long-term memories. They are split upon exiting, and their eidolons (spirits) exist as fleeting imprints of their former selves. Many other classical creatures of Greek myth (or generic fantasy) also appear on Theros. As you might expect, these include satyrs, minotaurs, giants, nymphs, sirens, chimera, sphinx, kraken, harpies, gorgons, cerberus, cyclopes, manticores, phoenixes, dragons, basilisks, and hydra. Try not to think too hard about how old Ajani is in cat years. 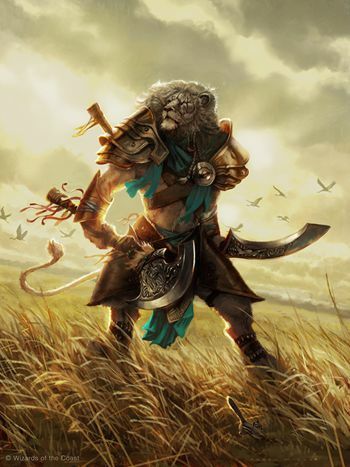 Ajani Goldmane is a Nacatl from the Alaran shard of Naya. He has spent his time since ascending travelling the planes, meeting other catfolk cultures and trying to be a mentor and example to everyone he meets. He has a fondness for his old friend Elspeth, who he has come looking for after her ordeal on New Phyrexia. Ashiok is a mysterious being who is investigating the metaphysics of Nyx. Ashiok manipulates a new polis into its destruction in order to gain a boon from Phenax in Building Toward A Dream, Part 1 and Building Toward a Dream, Part 2. Using their newfound ability to hide from the gods, Ashiok creates a proto-god of their own in Dreams of the City. For what purpose Ashiok is doing all of this has yet to be revealed, but their story continues somewhat in Dack Fayden's comics. Dack Fayden is a human thief from Fiora. He was led to Theros by a piece of a powerful gauntlet, but his story was abruptly cancelled just as his confrontation with Ashiok was to come to a head. His time on Theros is recounted in Dack Fayden Part II. We last saw Dack heading into the Underworld to find a way to stop Ashiok's plot for Theros. Elspeth Tirel is a human planeswalker from an unknown plane ravaged by Phyrexians. She stumbled across Theros in her youth, where she acquired the sword Godsend before planeswalking away. She returned following her failure on New Phyrexia and seeks an answer as to whether or not Theros's gods are the protectors they seem to be. Gideon Jura is a human hieromancer with a mysterious indestructible aura. Originally Kytheon Iora, he changed his name after his first planeswalk. Gideon has not returned to Theros — that we know of — since his childhood. His origin and subsequent ‘first' appearance are detailed in Chandra, Gideon, and the Purifying Fire and will not be repeated here. Kiora is a merfolk from Zendikar. She has been scouring the planes in search of mighty sea creatures to help her in the fight against the Eldrazi, and the powers of Theros's deep intrigues her. She wishes most of all to acquire Arixmethes, a kraken so large an entire city was built upon its back. Her intrusion has raised the ire of Thassa, god of the sea. Their duel is more relevant to Zendikar's story, and is recounted in The World of Zendikar Part III. Xenagos is a satyr native to Theros. While he was always a sociopath, the ignition of his planeswalker spark the subsequent discovery that his gods were a lie led him on a path to usurp them. He rules the satyrs of Skola Valley and has been using his influence to bring about his goals. His childhood is recounted in Thank the Gods. Ashiok lurks behind the scenes during this set. Anax and Cymede are the rulers of Akros. Long ago, King Anax used his intelligence to overcome his brother and become the city's heir, recounted in Prince Anax, Part 1 and Prince Anax, Part 2. While he is still somewhat of a sexist, he respects his wife a great deal and values her insight. Queen Cymede is secretly an elementalist and devotee of Keranos. She has the powers of a seer, but has refused Keranos in his desire to have her as his prophet. With her powers, she bolsters her husband's reign and works from behind the scenes to secure his rule. Daxos is a powerful prophet, able to hear the entire pantheon at once. He was claimed by Heliod at a young age, and serves as the head priest of his temple. He is not devout so much as resigned to his fate, until he meets and falls in love with Elspeth. Unfortunately, he dies as the result of Xenagos's meddling and is brought back as a Returned. Agnomakhos - The archon tyrant that once ruled Meletis. Anthousa - A Setessan leader and foster sister of Daxos. Arximethes - A huge kraken with an abandoned city on its back. Brimaz, King of Oreskos - King of Theros's Leonin and friend of Ajani. King Macar, the Gold-Cursed - Magic's version of the King Midas myth. Kydele, Chosen of Kruphix - Kruphix's most prized Prophet. Kynaios and Tiro of Meletis - The heroes (and lovers) who freed Meletis from Agnomakhos. Polukranos, World Eater - A hydra prized by Nylea, kept safe from the mortal realm in Nyx. Ravos, Soultender - An oracle of Athreos who secretly guides the dead back to the realm of the living. Thrasios, Triton Hero - A merfolk explorer with the blessing of Thassa who claims to have found the lost city of Olantin. Tymna the Weaver - A mortal who has mastered the magic of the fates. Tromokratis - No known lore. It is unclear why this was not an Arixmethes card. Hythonia the Cruel - No known lore, but presumably this is the Medusa stand-in. Medomai the Ageless - A sphinx who sometimes resides in Meletis. His return is typically seen as a bad omen. Triad of Fates - Masters of destiny. Tymaret, the Murder King - Returned leader of Odunas. 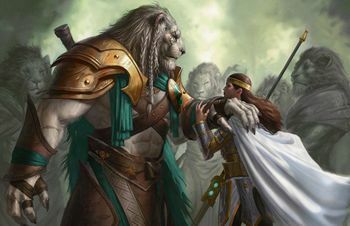 Ajani and Elspeth's friendship shines this set. Erebos, God of the Dead, is the black god, and is closest to Hades in terms of the Greek Pantheon. Erebos is the god of the underworld. Myths say he was banished there by Heliod in fear, as he was the first shadow of the world. He is also the god of wealth and misfortune, and wields his signature whip Mastix, typically used to pull souls back into the underworld. He is frequently worshipped by those who wish to accept their fates, as he accepts his place in the underworld. Heliod, God of the Sun, is everything you would expect from a white god... kind of. He represents law, justice, and community, but his personality is rather fickle and occasionally petty, much like Zeus from Greek mythology. He wields the sun spear Khrusor, and as god of the sun he blocks out Nyx with his light in the day. He has chosen both Gideon Jura (then known as Kytheon Iora) and Elspeth Tirel as his champions, however becoming Heliod's champion did not work out well for either of them. 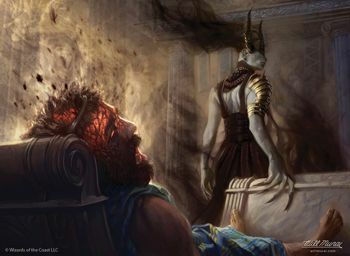 Heliod styles himself the head of the Theros pantheon, a title the other gods do not actively disabuse him of, but do not truly accept, either. Theros is the second block to feature a White-aligned antagonist. Nylea, God of the Hunt, is the green god, and the last of the five major gods of Theros. She is closest to the Greek goddess Artemis, and represents the hunt, seasons, and the forest — with a focus on a natural cycle. She wields the bow Ephixis in her hunts. She is the first of the gods to catch on to Xenagos's plan, although she fails to kill him when she has the chance. Purphoros, God of the Forge, is the red god, and is closest to greek god Hephaestus. He has a strong rivalry with his brother Heliod, and he represents both creation and destruction. He wields his hammer, Akmon, but created the weapon Godsend — the only sword capable of killing a god — before losing it. Godsend eventually ended up in the hands of Elspeth Tirel. Thassa, God of the Sea, is the blue god and is essentially a female Poseidon, with complete control over the sea. The merfolk of Theros, known as Tritons, worship her as head of the pantheon. When Kiora arrives on Theros, the Tritons believe her to be an incarnation of Thassa — something Kiora does not deny. Thassa is not happy about Kiora usurping her worshipers, though, and seeks to put the upstart in her place. Kiora loses the contest, but manages to steal Thassa's bident, Dikella, granting Kiora much of the sea god's power. Athreos, God of Passage, is responsible for guiding souls into the underworld and easing the passage from life to death. Iroas, God of Victory is the god of one half of war, specifically the noble aspects of honorable combat. He is the patron of the polis of Akros, which holds the Iroan Games in his honor. He takes the form of a centaur. His closest greek counterpart is Athena. Keranos, God of Storms, is the god of wisdom, although his gifts of wisdom tend to be double-edged. Kruphix, God of Horizons, is the god of the unknown. As such, he knows more about the origin of the gods than any other and has the accumulated knowledge of everyone on the plane. Because of this, he knows what the planeswalkers visiting the plane know, as revealed in Kruphix's Insight. He closely guards these secrets and is the most reclusive of the gods. Interestingly, while he does not take a specific form, he is shown with four arms, much like a Vedalken. Mogis, God of Slaughter, is the the other half of war, twin brother to Iroas and representing the brutal side of war. He is worshipped by the Minotaur of Theros, and takes their form. His closest greek counterpart is Ares. Pharika, God of Affliction, is worshipped by Gorgons and takes their form. She represents both poison and medicine — two sides of the same coin. Ephara, God of the Polis, represents civilization, civics, and religion. She is the god most worshipped in Meletis, and when Ashiok attempted to birth a new god, it was absorbed into Ephara. Karametra, God of Harvests, represents human control over nature, and as such has a rocky relationship with her sister, Nylea. She is the god most worshipped in Setessa. Phenax, God of Deception, is the minor god most involved in Theros' stories. He makes a deal with Ashiok that prevents the other gods from seeing Ashiok's actions, and he learns of Elspeth's otherworld nature and tries to exploit it. Xenagos, God of Revels, is the youngest of the gods, ascending to godhood after his plans succeed. He is slain by Elspeth using the sword (transformed into a spear) Godsend. That is it for today, demi-gods! Next time, we dive into the lore of Theros, and the Tragedy of Elspeth. Did we miss anything? Let us know in the comments or on the forum, and we will address it in future updates. Have a suggestion for something you want to see? Let us know, and we may address it in a future column. You can also follow me on twitter @Jay13x or Archive Trap Mini on Tumblr. Great article. Spelling is Dekella, not Dikella, though. Any specific reason why weapons of the gods are not linked with their cards? Aaaah I didn't realize it didn't get ported over. Fixing it! One of my favorite blocks but like Kamigawa I wish they explore more on their mechanics and side lores. It's likely we will return to Theros one day to oversee the fall of the Pantheon there. Hey, great article. I was recently talking to a friend about how I didn't know anything about Theros (other than I love their gods for EDH decks!). My only question: do you have more information or links about Gideon's "indestructible aura?" It isn't mentioned in his gamepedia page. Follow the link for Chandra, Gideon, and the Purifying Fire. It first appears in his Magic Origins story and continues through his appearances in the lead-up to BFZ. Hey, glad to see Archive Trap focusing on one of my favorite planes! One quick question - where does all of the Cymede-Kruphix stuff come from? The Planeswalker's Guide only talks about her ties to Keranos. It also mentions her being his "greatest servant," and growing the influence of his worshippers, none of which is easy to square with what you've written. What am I missing? It's a typo. I wrote Kruphix instead of Keranos. Keeping track of 15 gods isn't easy, lol. It's fixed now. Kydele and Cymede are two different people, but are similar enough that I get them mixed up.